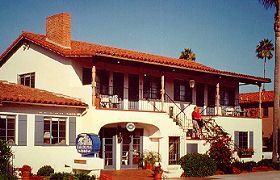 The CASA DEL MAR INN is a charming, 21 room Mediterranean-style family inn that combines the very best of a bed and breakfast inn and small hotel. It has a very special home-like atmosphere and is located only 1/2 block from the beautiful beach and harbor. Walk to excellent shopping, fine restaurants, and all beach activities. Two blocks from historic Stearns Wharf. A variety of room types offers accommodation options ranging from one- or two-room bungalow-style family suites with full kitchens and fireplaces to cozy rooms with one king or queen-sized bed. 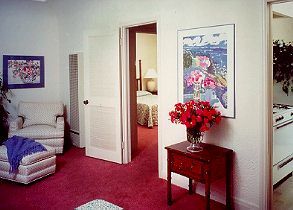 All rooms feature a private entrance, private bath, cable TV with remote control, and phone. Amenities include a relaxing courtyard jacuzzi and sun deck surrounded by lush gardens year round, a very generous buffet-style Continental breakfast,evening wine & cheese buffet and complimentary HIGH SPEED internet access in all rooms. A knowledgeable and friendly staff is always on hand to help select a restaurant, plan activities, or answer questions. Come spend some time with us at the beach in lovely Santa Barbara. 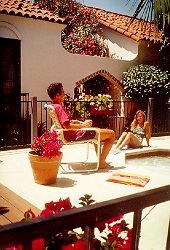 Enjoy boating, swimming, fishing, biking, or just relaxing by the Jacuzzi. Children and pets welcome. Ask about our Golf Packages and in-room Spa treatments. Rates: Economy to moderate. $109 - $304 (Plus 12% Occupancy Tax). Rates vary by season. Weekly and monthly rates available November through March. - Reservations: Credit card guarantee or first nights deposit required. 48 hour cancellation policy. - Discounts: Seniors, business travelers, travel agents. - Permitted: Children (under 12 years free), limited pets, no smoking. - Airport: Santa Barbara, Ca. 10 mi.